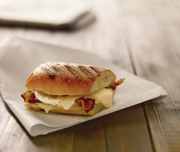 Breads of the World, a franchisee of Panera Bread locations in Columbus, Cincinnati, and Dayton, OH, tied the launch of Panera's new grilled breakfast sandwich into a campaign with a nonprofit organization. Customers would receive a free breakfast sandwich when they brought a non-perishable breakfast food item to the store, which was subsequently donated to local food banks. Bread of the World's AOR, RMD Advertising, was tasked to aid the effort. RMD sent egg carton-shaped press kits to print, broadcast, and online reporters, inviting them to a media relations kick-off day August 8. “A lot of them eat breakfast at Panera, so it was a great way to get more additional buzz,” says Angela Vallera, account executive at RMD. In-store signage alerted customers to the effort, and the media buzz from the first day brought in more customers up until August 17. The campaign also offered free product coupons to local large corporations and professional associations. In addition to media coverage in all markets, the effort collected 11,637 pounds of food to donate to the three food banks. “We got our product out there, got the sandwich in a lot of people's hands... and also were able to [collect] a lot of food,” Ketner-Dollison says. Breads of the World hosted another food drive in Cincinnati and Dayton around the holidays, Ketner-Dollison says. It also is planning another donation-based campaign around its coffees in early 2009.